Late Rome’s and early Byzantium’s greatest enemy, the Sassanid dynasty of Persia, entered the history books in 226 A.D., when a Persian vassal-king named Ardashir revolted against the Parthian rulers of Persia. The Parthians, a Central Asian warrior people, had in turn overthrown the Greek Seleucid rulers in 6 B.C. Ardashir had already greatly expanded his kingdom of Estakhr in what today is southwestern Iran. He twice defeated Artabanus V, the last Parthian king, and arranged a final, formal challenge for control of the empire on an open, rocky plain near Hormuz. According to legend, Ardashir rode out and challenged Artabanus to single combat, then turned his horse and feigned a panicked flight. When Artabanus followed, Ardashir slowed his horse and turned to loose an arrow in the ironically named “Parthian shot.” The arrow took the Parthian ruler in the heart and he slid from the saddle already dead. The Persians then routed the Parthian army, and Ardashir (sometimes styled Artaxerxes) became undisputed ruler of Persian lands. Ardashir named his dynasty after his grandfather, Sassan, a noted magus or Zoroastrian priest. Zoroastrianism, one of the oldest monothesitic faiths, had been associated with the old Achamaenid dynasty overthrown by Alexander the Great and been widespread among the Persians for over a thousand years. Under the new dynasty, Zoroastrianism became the state religion. The faith was codified and standardized, and became more centered on rituals than previously. The Sassanids encouraged that previously oral traditions be written down and preserved. Fire temples became a standard feature of every Persian city, with the greatest of them in the Sassanid capital of Ctesiphon. The early Parthian kings had adopted many ways of the preceding Seleucid Greek dyansty, but by their last decades Zoroastrianism was already reviving and Artabanus himself may have been a believer. The spiritual revival of Zoroastrianism coincided with the rise of Christianity just to the west, and the two vibrant faiths clashed in the mountains of eastern Anatolia. Armenia had followed Zoroaster’s faith in earlier times, and now the Sassanids hoped to bring it back into the fold. But Christianity also was gaining a firm following among the Armenians. Rome and Persia fought almost immediately after Ardashir’s seizure of power, when the Sassanids invaded Roman Mesopotamia and were briefly repulsed by Alexander Severus before seizing several key cities. Shapur I followed his father Ardashir in 242, and inherited the ongoing wars with Rome. The Roman Emperor Gordian attempted to re-take Mesopotamia, and after winning several battles was murdered. The Persians defeated his successor, Philip the Arab, and forced him to pay ransom and abandon Roman support for Armenia. Sassanid attempts to conquer the mountain kingdom led to new war with Rome in 253. Shapur defeated and captured the Emperor Valerian, killing or capturing 70,000 Romans at the Battle of Edessa. According to legend, he used the Roman leader as a human mounting block, making him kneel before Shapur’s horse so the king of kings could step on his back. This part may be true, but the legend that Shapur had Valerian’s corpse tanned and stuffed is probably not. words and deeds are praised. Rome’s ally Palmyra now took a hand, and its prince Odenathus recaptured Roman Mesopotamia. Such success could not go unpunished; the prince’s wife, the lovely Zenobia, had him killed and took power herself. Rome crushed her desert kingdom in retribution. After some years of peace on the western front, marked by many Persian campaigns in what today is Afghanistan and Pakistan, the Roman Emperor Carus invaded and captured Ctesiphon. At the peak of his success, he mysteriously died (the fate of several Roman rulers who fought the Sassanids) and the Persians recovered their capital. They fought Rome again in 297, suffering several defeats and losing most of their territories west of the Tigris River. The subsequent peace lasted 40 years, however, setting the stage for Fading Legions. At the time of the battles depicted in Fading Legions, Shapur II sat the throne as King of Kings. His father having died before Shapur’s birth, Shapur II enjoyed the distinction of being “born a king” and made much of this circumstance to echo the virgin birth of Zoroaster himself. With a baby on the throne, both the Zoroastrian clergy and the powerful landowning class greatly expanded their power. Yet by age 15, Shapur II had reclaimed his absolute authority and brought both to heel. The peace with Rome allowed Shapur to consolidate power and prepare for a new struggle, which became inevitable in 313 when Constantine legalized Christianity in Rome and converted. Christianity had attracted a number of Persian converts; its similarity to Zoroastrianism made it easy to understand, and many found its personal nature highly attractive. But once it started down the road to becoming Rome’s state religion, Shapur considered anyone following it to be committing treason against the throne. In 339 he declared the followers of Christ to be criminals, and also cracked down on Jews and Manicheans (followers of Mani, a magus who tried to fuse the three faiths). Shapur struck first, invading Roman Mesopotamia in 340 and winning some field battles but failing to take the great fortress-city of Nisibis. In 350 he made peace with Rome to go fight an invasion of the Huns, who he defeated and forced into an alliance in 357. 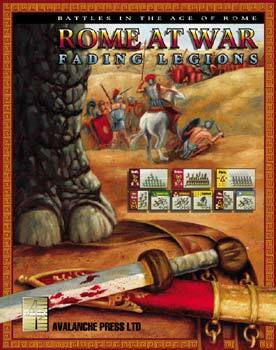 With his eastern borders secure, he returned to war with Rome, leading to the battles shown in Fading Legions. The Sassanid army led by Shapur II, like those of his predecessors and the later Parthians, was built around cataphract cavalry. These were heavily armored horses and riders, relying on shock action with lances. Elephants, obtained from India, also featured in the Persian order of battle, and usually large numbers of tribal light cavalry. Persian armies usually brought a great deal of infantry levies with them to pin an enemy army in place, but relied on the heavy horse for the decisive blow. Mounted bowmen, a response to Shapur’s war with the Huns, were just starting to appear in larger numbers. After his defeat of the Romans, Shapur (now known as The Great) regained all the territories lost in the previous century, plus a free hand to deal with Armenia. But his successors would be much weaker men, and Persia remained weak until the great king of kings Chosroes I Anashirvan in 531. But that’s another story and, eventually, another game.